Congratulations po sa inyong baby! Congrats! Your baby is so cute! Happy born day to your baby po! :) So cute! Welcome to the world dear baby :) Have a wonderful life. And he is a healthy baby boy. Big for a newly born baby. aww! how sweet! happy birthday! One of the happiest moments in a mother's life. Read this somewhere: The only time mothers are happy when their children cry is their time of birth. Congratulations!!! Buti ka pa you're done na, I still have 3months to go! one of the most important, happiest and much awaited day in every mothers lives. I never had pictures of my son in the delivery room.I forgot to bring the camera and hubby's are not allowed in side the hospital in the middle east. 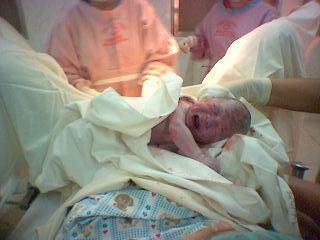 I still remember the first day when I gave birth to my son. Now I am excited with my second baby. COngrats to your baby who is now seven. uy July 14, ka-birthday nya ang younger bro ko. :) belated happy birthday to your son. it's always good to go back in time and relive those memories.